Matthew Mishory, Joshua Tree, 1951: A Portrait of James Dean, 2012, 35 mm, color, 93 minutes. James Dean (James Preston). Photo: Iconoclastic Features. Indeed, against mimetic standards, it would be unfair to judge Joshua Tree, 1951 as a James Dean biopic. As its subtitle makes clear, the film is actually an exercise in portraiture. If biography serves as a literary aggrandizement and idealization of its subject, portraiture’s value is situated in its inherent criticality—not only toward its human focal point, but against the world that he or she inhabits. Those eager for “the real story” of James Dean will have to wait a little longer. Matthew Mishory, in his directorial debut, has chosen to focus on the year before Dean’s star rose. By homing in on this seemingly tiny slice of time, the film manages a nuanced portrayal of an entire era, as well as a somewhat damning appraisal of the Hollywood system that endures to this day. For Mishory, Dean was the twentieth-century reincarnation of Arthur Rimbaud, whose words introduce the film: a rebel queer icon whose story is equal parts myth and truth. Despite what contemporaneous propaganda bespoke, Joshua Tree, 1951 shows James Dean (played by James Preston) as the gay man he in fact was, a figure who, in spite or perhaps because of his genuine talent, knew that the only clear way to stardom and iconhood was through the use of his looks and his body. 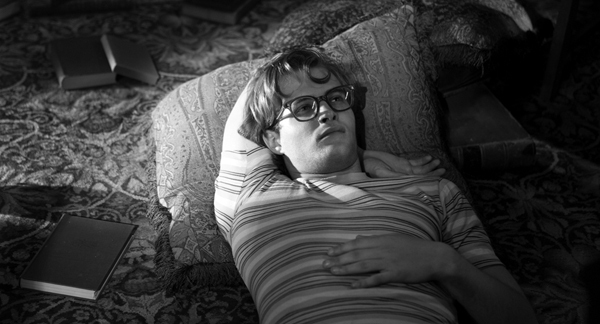 The film’s script relies on firsthand accounts by many in Dean’s inner circle, and depicts the complex mentoring arrangement he entered into with Hollywood man-with-connections Rogers Brackett (Edward Singletary), his relationship with roommate/lover William Bast (Dan Glenn), and his various flings along the way, effectively mapping that troubled terrain where ambition and desire become conflated. The empty desertscapes of Joshua Tree National Park, through which Dean often wanders, thus serve as an escape from the ravenous machinery of Los Angeles, implying that it is the sole place where he is able to attain an untroubled and unitary conception of self. This is not to imply that Dean merely fucked his way into Hollywood; rather, Joshua Tree gives us an account of the process by which Hollywood molds an individual into its systemic image of a star. That it accomplishes this through a formal subversion of Hollywood’s stylistic code—with its deliberately slow rhythm and acute attention paid to photography, nearly every image resembling a still—makes the message all the more subtle. Joshua Tree, 1951: A Portrait of James Dean plays Wednesday, December 12–Tuesday, December 18 at the Art Theatre of Long Beach.